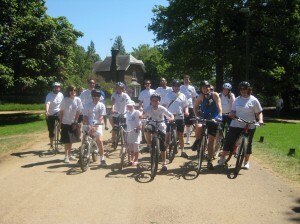 Today I finished a wonderful sponsored bike around Richmond Park, in aid of UCLH Leukaemia Unit Charity. This charity have been helping my uncle throughout the past 5 years of his treatment for Leukaemia, primarily by supporting his out-patient care and by providing bursaries for the fantastic postgrad nurses who work there. Edited 27th May: Here are the photos! At seven miles long, the ride was short but very pleasant. It weaved it’s way around the perimeter of the park over gravel and for the most part we were riding under the dappled shade of the mighty oak trees. From time to time we spotted the park’s famous deer, and joked that their ancestors must have regularly ended up on King Henry VIII’s dinner table! 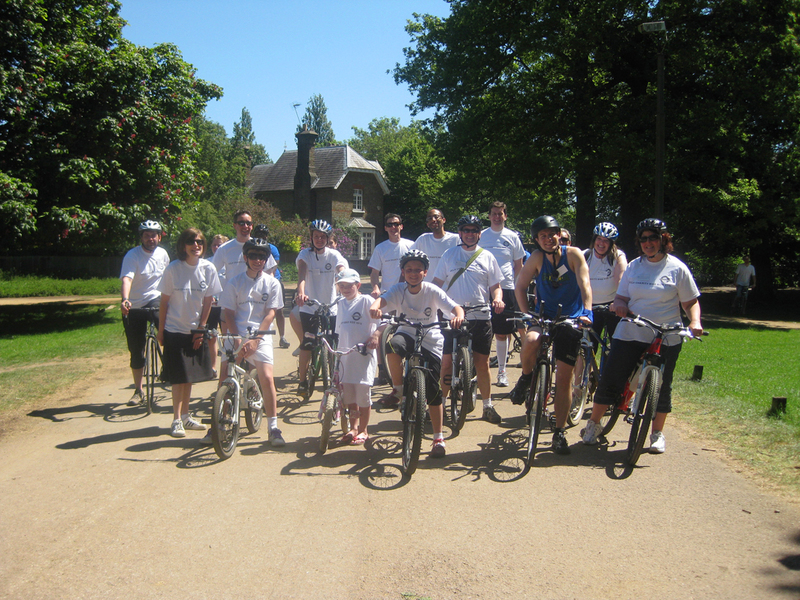 For the ride I was joined by a number of UCLH staff members and relatives of current patients. There was even a former patient who had recovered from the chemotherapy received at the UCLH Leukaemia unit. He wanted to express his thanks with his new lease of life the unit had allowed him. It was an absolutely beautiful day out and it was all for a good cause. Thanks to all who donated via my justgiving page: justgiving.com/michaelokarimia With their help I have exceeded my donation target. After the ride, the trinkets were handed out! I recently set up Cruise Control on Vista PC for development purposes and I thought it might be useful to document the process I followed. In my implementation there are 3 components to continuous integration system. The process involved is fairly straightforward. First the trunk of the source code is pulled from the repository to the working directory. MSbuild.exe compiles the source code, then the nUnit tests. Finally the tests are run against the complied code. The success or failure of of the tests is output as an xml file and is reported in web dashboard. I have also installed CCtray, a program that runs in the systray showing the state of the last build. It allows builds to be run manually, as opposed to a on a timed interval . The CC web dashboard shows a wealth of information on the build state and if any Nunit tests have failed. 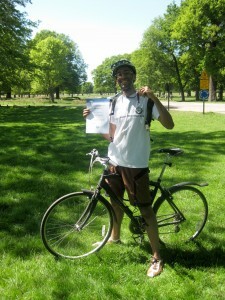 I achieved this by following instructions on The CCNET homepage which I’ve summarised below. In my case the editing, building and testing of the code is done on my local machine along with hosting the source control. In a bigger environment your would host these services seperately for performance reasons, but in my scenario this is not an issue. Once CC net is installed the server must be started by running the CruiseControl.net icon on the desktop. The server is controlled via it’s config file, which is found in C:\Program Files\CruiseControl.NET\server\ccnet.config. This file is at the heart if to the entire integration process, and contains the list of actions the server will complete on each build. Any edits to ccnet.confg will restart the CCnet server. To complete the first stage of a build, which is to checkout the latest version of the code, I added the source control block to ccnet.config. It which defines where code is within the repository and where it is checked out to. My example is for a SVN but Cruise Control.net supports many other source control systems. The next step is to add to the config file instructions to build the code that has been checked out. To do this I used the MSbuild.exe file found in C:\Windows\Microsoft.NET\Framework\v3.5. To save my aching fingers from typing too much, I added the above path to it to the system path. This builds the code that has been checked out. Note that the workingDirectory values are the same. I also added another block which complies the nUnit tests. In my case, the trunk directory that was checked out contains both the data classes and Nunit test classes so only one checkout was required. Now that the code has been complied, the unit tests are to be run. I have added the path to the nunit exes to the system path. The Nunit-console.exe runs the tests and creates an xml file containing the status report of the tests run against the classes. Under this configuration it was possible for me to check code into the trunk of my project, and force a build that checked out the code and unit tests, and automatically ran the tests against it, outputing the results to a the CCNet web dashboard, via a single click. This entire process can be run from the CCNet web dashboard, or more conveniently, the CCTray sys tray program. There is a moderate overhead in setting up continuous integration but the return on investment grows the longer the system is developed. Where to go on from here? My setup could be improved in a number of ways.